Do you need to purchase new machinery for your construction company? Are you looking for a good and affordable earthmover? One of the most basic task when carrying a construction project is the treatment of the lawn. In Mandurah, you can either hire earthmoving services or buy and hire the best earthing equipment. It is essential that you count with quality construction machines in order to maximize the efficiency of the work, whether it comes about groundwork or any other task. In addition, every truck and machinery like dumpers, trenching vehicles, excavators or bulldozers, must be driven by experienced and knowledge filled operators. Get to know some must-have earthmoving construction heavy equipment. Excavators: being available either with wheels or track, they are commonly used to lift heavy pieces and digging or making holes. Backhoe loaders: this medium sized equipment is thought to carry small jobs like moving dirt and placing small pipes. Bulldozers: it is an extremely reliable equipment which is mostly used for pushing large amounts of earth. Motor graders: these machines are used to prepare the terrain before adding asphalt or to fine grade gravel roads, for example. Skidsteer loaders: its best advantage is that they are very versatile, being one of the machines that every contractor should count with. 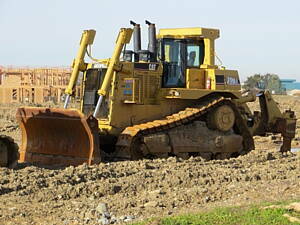 Crawler loaders: it has characteristics from both excavators and backhoes. At Infoisinfo we always work hard to be able to provide you with the most useful information possible so that you can easily find the best products and services for you or your company in Mandurah. As we do about you, we care about your business and we’d like to help you succeed. For your construction projects, you need to count with the right materials and machinery that ease the process while providing the best results. Therefore, we have prepared a list of the best earthmoving companies in Mandurah for you to choose from. Get in touch thanks to the contact details available on our directory, such as phone numbers, websites, address and opening times. In addition, you can have a look at comments and valuation from other clients to get a better idea about the quality of the earthing equipment. Dudley Park, 8 Davies St, Mandurah. Mandurah. WA, 6210. Lot 206 Gordon Rd, Mandurah, WA,6210, Mandurah. Mandurah. WA. Po Box 2195, Mandurah, WA,6210, Mandurah. Mandurah. WA. 11 Daydream Plza, Halls Head,WA, 6210, Halls Head. Mandurah. WA. 21 Hibbertia Folw, Halls Head,WA, 6210, Halls Head. Mandurah. WA.